You can print out the form, complete it and bring it in and one of our lovely store assistants will present you with your new card immediately. Alternatively, you can print the form out and send it to the address below where you will be contacted for payment and then your card will be sent to you in the post. If you can't open the file please download Acrobat Reader for free here. The Loyalty Card is open to applicants from the UK aged 18 or over. The card is valid for 365 days from date of purchase. 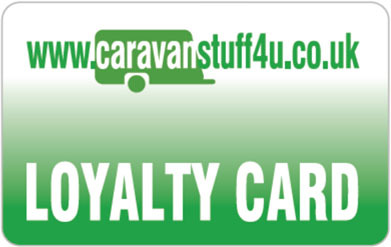 By participating in the Loyalty Card scheme you are supplying Caravan Stuff 4 U Ltd with your contact details. Your details will not be passed on to any third parties for marketing purposes and we will only use your details in order to administer the scheme. Only named persons can use the card (up to 2 persons). The Loyalty scheme remains the property of Caravan Stuff 4 U Ltd, who reserves the right to decline issue, withdraw or amend the scheme at any time. The Loyalty scheme is not a credit or guarantee scheme and can only be used in participating Caravan Stuff 4 U Ltd stores and web sites. The scheme is only valid for Caravan Stuff 4 U Ltd purchases. The benefit may be subject to change and the voucher on the www.caravanstuff4u.co.uk web site will only be valid for the benefit applicable to the scheme at the time. No cash alternative to vouchers will be allowable. The scheme cannot be used to qualify for additional benefit from any sale item and/or discount for the same transaction, or orders on eBay and Amazon. The promoter of the card is Caravan Stuff 4 U Ltd. This scheme cannot be used in conjunction with Caravan Stuff 4 U Ltd Staff Discount. Customers are required to inform Caravan Stuff 4 U Ltd of any changes to their name or address/email address details as failure to do so may result in loss of vouchers. Loyalty cards cost £5.00 and are valid for one year from date of purchase. The Loyalty card will allow the card holder to receive 5% discount on all purchases in store * (our web site, eBay and Amazon not included). * Bottled gas, Gift vouchers & carriage are excluded.